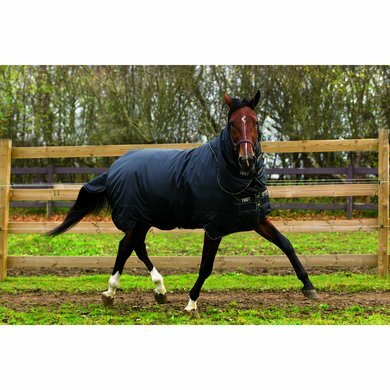 The Horseware Trot Plus Heavy is an outdoor rug made of lightweight, yet durable 840D polyester. The outside is waterproof and breathable at the same time. The blanket has a nylon lining and a 350g filling. 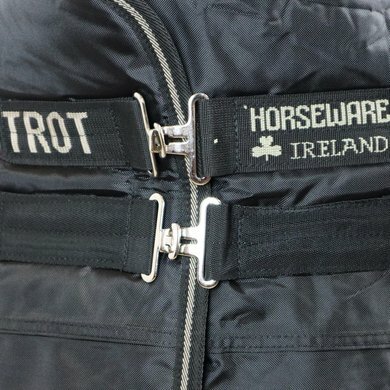 The Horseware Trot Plus is specially cut for smaller horses, such as trotters. The blanket is less deeply cut on the side. 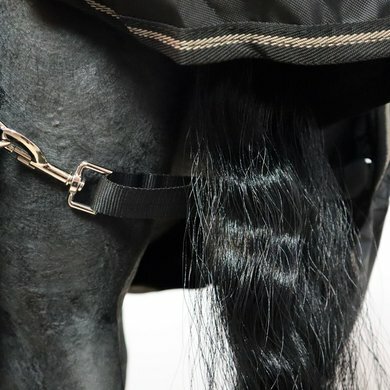 In addition, the blanket "Leg Arches" at the front and rear legs, this special cut gives the horse even more freedom of movement. The blanket has a double hook / eye closure on the chest, three adjustable cross surcingles under the abdomen, a pelvic belt and a tail flap. 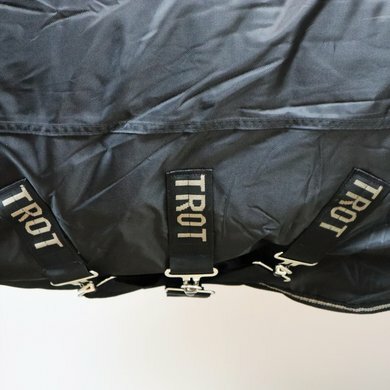 In addition, the blanket has a detachable neck of 150g which closes with velcro, the neck can be attached to the blanket by four sturdy metal eyes that the blanket and the Velcro closures of the neck. The 350gram filling consists of fiberfill and is made of a hollow polyester filling and is also called 'pile filling'. An important feature of this filling is that it always registers the original thickness and structure. Due to the thermo effect the blanket keeps body heat and the cold outside. 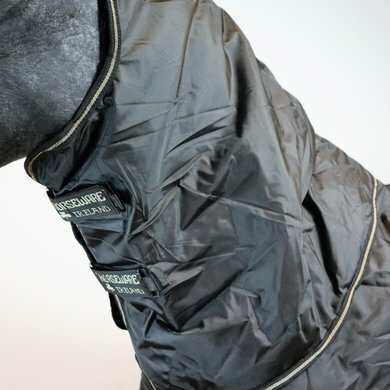 The filling consists of several layers, allowing warm air to circulate between the horse and the outer material of the blanket. This provides extra air circulation and absorption of excess body heat. 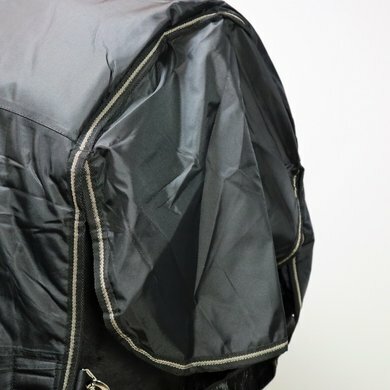 The underblanket can be washed in a normal washing machine, so you have to wash your outdoor blanket less often, so the waterproof coating and the breathability decreases less quickly. 94% would buy this product again. Class Fit - Typically Horseware. 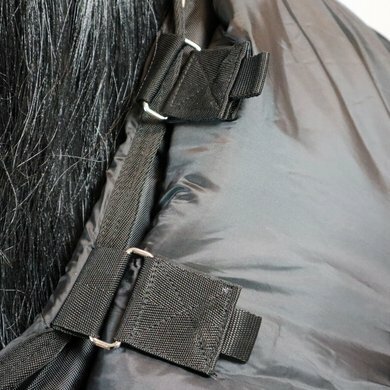 Neck piece can be easily attached if necessary. 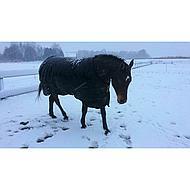 Is wonderful on my narrow warmblood - does not rub, does not slip u does not constrain. I do not miss the leg straps at all. Horse seems very happy with it! For us the optimal blanket, although my horse is not a trotter. Very nice well-fitting blanket. Connect nicely to my horse. Also the neck. Not such a floppy thing. I myself have no trotter and this is the 2nd time that I order this blanket because he likes it so well. Never hangs crooked and does not break quickly despite playing a lot with his mates. I bought the blanket for my young Spaniard and she is very beautiful. Unfortunately, she has already had 2 small cracks within a short time while my Rambo blankets are still healty. As you notice already quality differences. For the price performance ratio but absolutely OK. Question: How much denier does the blanket have?